Linear measurements or physically measuring certain areas of the live animal to determine their frame score and comparing their phenotype to that of an “ideal” set of measurements. Another practice we employ is pregnancy checking our South Poll cows and heifers. Although both of us at Holiday Ranch have attended classes on pregnancy checking by palpation, we are still not confident of our abilities. Most ranchers that do not perform their own pregnancy checking employ the services of their veterinarian. For us, this is not an expense we can justify due to mileage charges and other expenses the vet must charge. We also work our cattle slowly and gently. When the vet is on-site that hurry-up-and-get-them-worked mentality is not the way we like to operate. At Holiday Ranch we preg-check by drawing a blood sample. This technique is easily learned and although we don’t consider ourselves good at this, we can usually get enough blood to obtain a result. The test we use is called BioPRYN®. BioPRYN is a pregnancy detection tool for use in ruminant animals. It measures the presence of Pregnancy-Specific Protein B (PSPB) in the blood circulation of the animal. PSPB is a protein that is produced only by the placenta of the growing fetus. 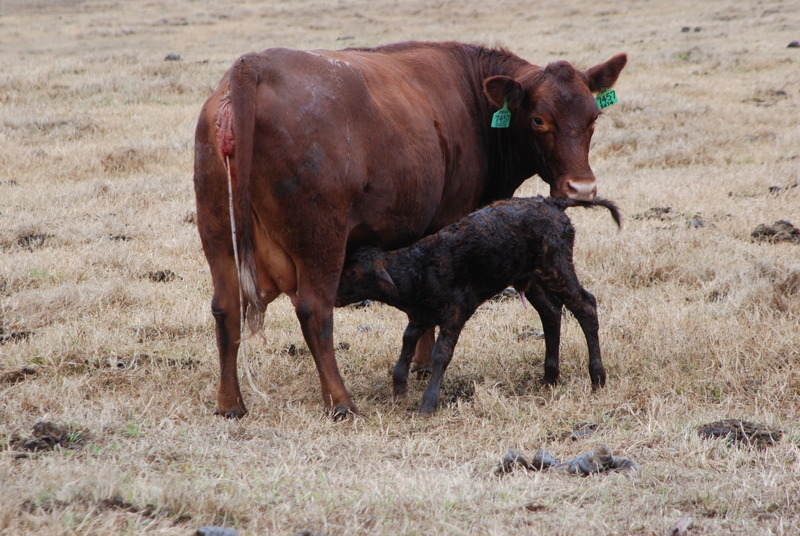 Blood can be drawn on cows and heifers at 28 days or more post-breeding and cows – must be 90 days post-calving to ensure accuracy. If a sample is taken within this 90 day postpartum window, there is a chance for a false positive due to residual PSPB which has not cleared from the maternal blood stream. The accuracy is 99 percent when the test determines an animal open. 1. Use a fresh bleeding needle with every cow. Cross-contamination of blood will affect the results. 2. Screw the needle onto the needle holder. 3. Insert the blood collection tube into the other end of the needle holder until the stopper touches the back portion of the needle. Do not puncture the stopper. Hold these assembled materials in one hand. 4. Lift the cow’s tail with the other hand. For us, it helps if you have someone hold the cows tail straight up for you. 5. Insert the needle about 1/2 inch deep and perpendicular to the tail at the underside, midline and at about 3 to 6 inches from the base of the tail. In this region, there is a longitudinal, midline ridge of skin through which you push the needle. 6. Blood will appear at the junction of the stopper and the back portion of the needle once the vein is punctured. If it does not appear, pull the needle out slightly and insert in a different direction until the vein is punctured. 7. Once blood is seen, push the tube onto the needle. Be sure to keep the needle under the skin since vacuum will pull blood into the tube and if lost, blood cannot be collected. 8. Use a second tube if this happens. 9. Collect 2 cc or more of blood. 10. Withdraw the needle from the skin and remove the tube from the tube holder. 11. 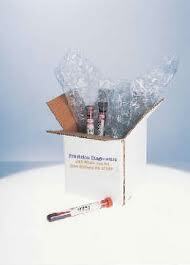 Sequentially label the sample vials with the ear tag ID using a permanent marker on the vial label. Labeling the tube will assist the laboratory in sample organization and help expedite results. 12. Place the tube in an ice rack or refrigerator until shipment. 13. Then, ship your samples to one of the labs listed on the BioPRYN website. This entry was posted on December 7, 2011 at 11:04 AM and filed under Agriculture,Animals,Cattle,Holiday Ranch,South Poll Grass Cattle. You can follow any responses to this entry through the RSS feed.